Summer is in full swing and one way to beat the heat is to spend your day poolside hosting a bbq with all of your friends and family. Relaxing out by the pool with food could mean more guests than you invited; humidity, sunburns, and even bugs. If you are looking to beat the heat and find solutions for pest control in Mesa, you may want to know about the guests you are encountering and how to get rid of them. As we find ourselves moving deeper into the Summer months, you may notice an increase in ants, flies and mosquitoes. These insect populations grow throughout the warm months making it harder to defeat their army of small pests. They want to crash the party, but they also carry disease and other allergens that could be harmful to your and your party guests so it is best to avoid them. There are also more alternatives to prevent flies that you can try like fly sprays, fly trap papers or plug-ins. If you believe that the fly problem is more serious, try looking into getting professional pest control treatments in Mesa, because it may be necessary for you and your benefit. Common Arizona pests you may find in the Summer time around the bbq could be the red ant. They have a sting that can be very painful. These ants are usually found in groups, making it easy to find where they are traveling. Once you find the nest, you can try these simple solutions of pouring some vinegar or boiling water down the ant hole. A more permanent solution to these red ants can come from a Mesa extermination company. One of summer’s most notorious pests is mosquitoes. They are most known for the painful, itchy red bumps they leave behind after being stung. These stinging little pests can also transmit serious diseases like West Nile Virus or Encephalitis. Summer BBQ repellent for mosquitoes? Try rosemary! Throw some on the grill and you are set for a bite free night from any mosquito. So do you want to through a bbq party and have too many pests hanging around?! Call or visit Varsity Termite and Pest Control today and talk to a professional about what issue you have come across regarding pests. 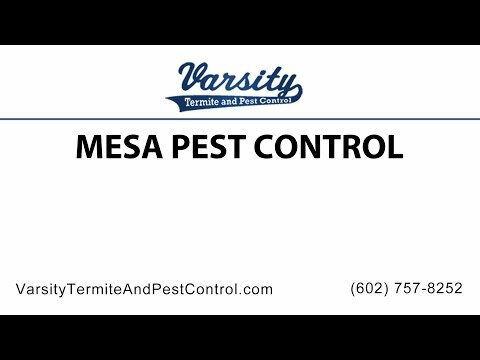 Our Mesa expert exterminators would be glad to help you. If you have any more questions or concerns about pest control and want to know more information, explore our website or give us call today!